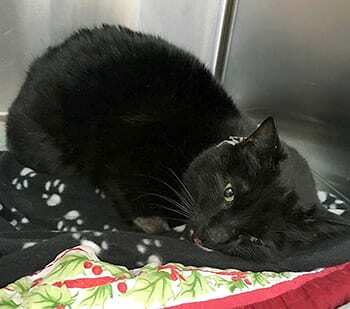 Kevin is one lucky black cat after being found on the side of the road by a Good Samaritan who turned his five-ton truck around to stop and check if he was alive. The three-year-old feline had been hit by a car and suffered injuries to his top and bottom jaw. It seemed to be touch-and-go at first for the courageous kitty, but none of his injuries were deemed life-threatening or are expected to carry any lasting effects. He is expected to make a full recovery in eight weeks and is currently at Burnaby Veterinary Hospital. “He might have some mild asymmetry in his face and he might have decreased hearing because his left eardrum ruptured, but I think his life will be pretty good,” says Burnaby Hospital veterinarian Dr. Claudia Richter, who notes the necessary surgery was generously donated by our friends at West Coast Veterinary Dental Services. “He’s doing great, he just came back from a re-check and they’re really happy with his progress,” says Richter. As a bonus, the man who found Kevin and brought him in to the Burnaby SPCA is interested in adding Kevin to his family, which already includes cats. Once Kevin is fully recovered, he will be available to be adopted by the burly truck driver, a welcome addition to his feline-friendly home. “We’re just glad he’s going to get a second chance at a happy, active life in a loving, forever home,” Voutilainen says.